Do you know the best time to paint the exterior of your house or which paint you should use? Do you want to know the steps you should take before painting an exterior surface? All of these questions are answered by Mike Rosasco, the President of PaintMaster, a commercial and residential painting company that has been serving the Triad for nearly 30 years. Mike and PaintMaster have earned certifications in safety through Evetta auditing company, as well as certifications in scaffold erecting, media blasting (paint removal) certifications through (PDCA) Painting and Decorating Contractors of America, general corrosion, general coatings and specialty coatings certifications through NACE International. 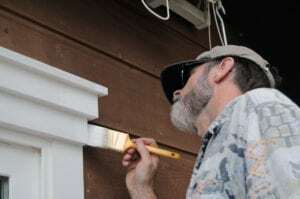 Using his years of knowledge and experience, Mike has taken some time to answer several questions regarding exterior house painting and how to prepare a house for painting. Q: What is the best time of year for exterior painting? 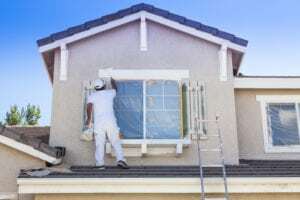 A: Experienced, professional exterior house painters can achieve the same high-quality results while painting the exterior during all four seasons with good planning. However, one of these seasons is more paint and painter friendly when repainting your home – the fall time! The temperature highs are usually in the 70s, humidity is low, and it doesn’t rain as often. These lower temps and ideal weather conditions make it easier to work with the paint, keeping it from drying as fast. This gives the applicator more working time to apply it onto the surface and cover more square footage before drying. The cooler temps allow the paint to stay wet longer and also enables the coating to self-level a little more which reduces the appearance of brush marks. Q: What is the best type of outdoor/exterior paint for painting a house? Why? A: For residential and commercial surfaces, 100% Acrylic Latex Paint is the best exterior paint because it is the most flexible. As temperatures rise, all surfaces expand and as temperatures cool, all surfaces contract. This movement occurs every day of each year. With that said, there are many exterior surfaces that sometimes require a different type of coating depending on the type of surface and what its use is. For example, block walls in a car wash bay are exposed to both the outdoor elements and cleaning solutions. A flexible coating is needed, but in this case flexibility is sacrificed for a more abrasive and chemical resistant exterior paint. Q: What steps do you take prior to painting an exterior surface? Do you inspect for rot, pressure wash the surface, etc. and why? A: Yes, prior to painting an inspection is done to identify all rotten wood and replace or repair it. Scraping and sanding the surface to remove any loose paint, as well as pressure washing properly to clean it, is important so that the new coat of paint will bond well. In addition, it is important to determine what type of coating is presently used on the exterior surface you wish to paint. For example: Is it Latex or Alkyd. Is the sheen flat, satin, semi-gloss or gloss? What type of surface is it? Determining this helps to ensure a compatible coating of paint is selected. Inspecting the surface texture is also important. Are there brush marks and or roller marks already in the existing coatings? If so, then it should be ok to use a brush or roller again; however, if these are not found, the customer may want a spray application of paint used instead. Finally, look at the areas surrounding the project. Are there any flowers, vegetables or other vegetation that needs to be protected from the work process? If so, then take extra steps to cover and protect these before painting.